Here we see the first intimation of the “theology of lay liturgical ministry” that would be ordered by Vatican II, whereby the whole assembly shares the responsibility for celebrating Mass. Thus, Pius XII effectively undermined his own teaching on the Catholic priesthood found elsewhere in the same document. With such confusion between the ordained and the non-ordained, is there any wonder that there developed a crisis of priestly identity? The first result of the Commission’s work was the restructuring of the Easter Vigil rite (1951) with a view to promoting “active participation” leading to an entire revision of the Holy Week liturgy in 1955. This in turn would spawn all subsequent liturgical reforms up to and after Vatican II, with the same rationale in mind. There was no doubt in the minds of the two most influential members of the Commission, Fr. 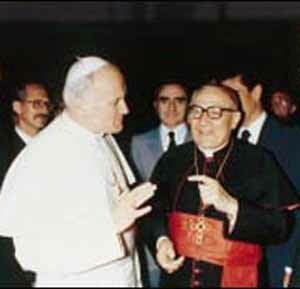 Bugnini and Fr. Ferdinando Antonelli, that the reforms they devised in the 1950s were based on the same principles as the post-conciliar reforms. Precisely. Yet at that critical point in history when papal support for the protection of the traditional rites was essential, Pius XII was on the wrong side, aligning himself with those who aimed to demolish Tradition. Continuity with Tradition was exactly what Pius XII’s Commission did not want, as was made abundantly clear in the 1951 Decree (6) introducing an experimental Easter Vigil service and also in the 1955 Decree (7) making it (and the whole of the Holy Week reforms) obligatory for the Roman rite. Both of these Decrees, as we shall see below, contain unjustified criticisms of the traditional rites; they are also accompanied by Instructions for new rites in which the emphasis was placed on the “active participation” of the laity. By 1955, with the Decree Maxima Redemptionis, the shape of this most ancient of Vigils (which St. Augustine called the “Mother of all Vigils”) was reformulated and some texts were massively curtailed. And new arrangements were invented for the priest to face the people, involving “dialogue” with them in the vernacular. One could say that the decline of the sense of the sacred began in embryonic form with the 1951-1955 changes. 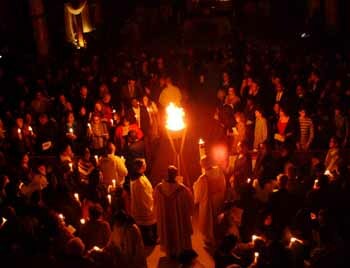 Under pressure from the French and German Bishops, Pius XII made a new rule that the Church should no longer hold the Easter Vigil in daylight hours, as had been the case since the 7th or 8th centuries, but should revert to the practice of the first Christians who held it after dark. 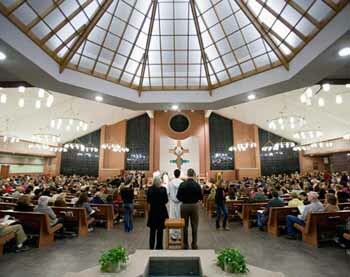 No convincing reason was given by the Congregation of Rites as to why the night time should be deemed the “proper hour” for the Vigil service. In fact, there is no “proper” hour for a vigil.The mystery of the Church's liturgy is, in its essence, not bound by the clock. In liturgical terms, a vigil refers to the eve of a feast day and can be celebrated with propriety at any time of the day. However, Maxima Redemptionis arbitrarily insisted that the ceremonies “may not begin before twilight, or certainly not before sunset.” But the timing of the Easter Vigil had never been set by astronomical calculation, as if everything depended on how many degrees the sun is above or below the horizon. But the point about his 1955 Decree Maxima Redemptionis was that it did state that the early Christian Easter Vigil was “more suitable and proper” than what had developed over the intervening centuries; and it did reject the principle that “the more recent liturgical rites likewise deserve reverence and respect.” There is no mistaking the language used in the Decree to denigrate the liturgical tradition as it had developed up to the 1950s. Maxima Redemptionis carried a note of reprobation of what had been approved and maintained as Catholic practice for centuries, with the scarcely veiled implication that for most of her history the Church had conducted her worship on wrong lines. In it, the accusation was made that the Easter Vigil had lost its original clarity and the meaning of its words and symbols when it was “torn” from its “proper” nocturnal setting and was no longer in line with the Gospel accounts. According to the reformers, it had even become “harmful” to the symbolic meaning of the Vigil. (9) Anyone would think they were referring to a monstrous iniquity that must be removed from the Church. Is it conceivable that the traditional manner of celebrating the Easter Vigil in the daytime was a disastrous mistake and that the Church had to wait 14 centuries for Bugnini and his henchmen to put the matter right? Of course not, and in the next instalment we will be examining the spurious reasons for the Easter Vigil changes, which were published in the 1951 and 1955 Decrees. The members of the Commission in 1948 were: Card. Clemente Micara, Pro-Prefect of the Sacred Congregation of Rites (President); Fr. Annibale Bugnini CM (Secretary); Msgr. Alfonso Carinci, Secretary of the Congregation of Rites; Fr. Agostino Bea SJ; Fr. Ferdinando Antonelli OFM; Fr. Joseph Löw CSSR; Dom Anselmo Albareda OSB, Prefect of the Vatican Library. A. Bugnini, The Simplification of the Rubrics: Spirit and Practical Consequences of the Decree of the Sacred Congregation of Rites March 23, 1955, with a Preface by Ferdinando Antonelli, Collegeville, MN: Doyle & Finegan, , 1955. Cf. Nicola Giampietro, The Development of the Liturgical Reform: As Seen by Cardinal Ferdinando Antonelli from 1948-1970, Fort Collins CO: Roman Catholic Books, 2009, p. 69. Giampietro gleaned his information from research into Antonelli’s personal writings as well as archival material from the minutes of the Commissions on which the Cardinal had served. Ibid., p. 192. This is not to suggest that Card. Antonelli wanted to preserve intact the Church’s liturgical tradition. He was Secretary for the Liturgical Commission of the Second Vatican Council, a member of the post-conciliar Concilium and became Secretary of the Sacred Congregation for Rites in 1965. De solemni vigilia paschali instauranda, Acta Apostolicae Sedis, 1951, pp. 128-37. There exists no English translation. Maxima Redemptionis, Acta Apostolicae Sedis, 1955, pp. 838-847. Mediator Dei, 1947 n. 61. Maxima Redemptionis: “profecto non sine detrimento liturgici sensus, nec sine confusione inter evangélicas narrationes et ad eas pertinentes liturgicas repraesentationes. Solemnis praesertim paschalis vigiliae liturgia, a propria nocturna sede avulsa, nativam perspicuitatem ac verborum et symbolorum sensum amisit.” (certainly not without detriment to the liturgical meaning, creating confusion among the Gospels accounts and related liturgical ceremonies. Principally the solemn liturgy of the Easter Vigil, snatched away from its proper nightly time, lost its innate clarity as well as the meaning of words and symbols) The expression avulsa (“snatched away”) is offensive and unwarranted, as it has a particularly violent connotation in Latin, descriptive of robbery, abduction etc.